Being that Puerto Vallarta is one of Mexico’s most popular and successful beach destinations, it is no surprise that this incredible city is brimming full of once in a lifetime experiences for adventure lovers, nature fans and relaxation hunters. The number of things to do in Puerto Vallarta is endless and need not break the bank either. Here is a selection of some of the top Puerto Vallarta Activities to enjoy during your stay in the Pacific playground. It might seem like an obvious piece of advice, but Puerto Vallarta is full of beautiful beaches. To the north in Nuevo Vallarta you can enjoy the endless stretch of sandy beach for which Riviera Nayarit is famed, while to the south, Puerto Vallarta offers a host of little coved beaches that you need a boat to get to. For the southern boat-bound beaches, you can get water taxis or charter yachts, depending on your budget. Either way, you will have a magical time discovering secluded coves, waterfalls and river outlets. The Malecon, as Puerto Vallarta’s boardwalk is known, is the ideal location during the day for people watching, sunset gazing and souvenir shopping (oh, and tequila tasting!). The boardwalk is about a mile long from start to finish, lined with stores, bars, restaurants, tequila sellers, artisans and street performers. At night the strip comes alive with music and 2 for 1 offers on your favorite cocktails while a selection of restaurants also offer family dining. Divers and snorkelers have arrived to the right place, especially during summer when the water is warm enough to forget about a wetsuit. There are a number of great dive sites that will leave you enchanted by Puerto Vallarta’s marine life, especially around Los Arcos rock formation and the Marietas Islands with their hidden beach that can be found at the center of the islands! From November through March, whale watching is a top Puerto Vallarta activity for all the family to enjoy. Banderas Bay teems with humpback whales during the season and you are sure to see a wonderful display of breaching whales. The mountains that surround Puerto Vallarta provide fertile soil for all kinds of adventures from hiking, mountain biking, horseback riding and off-load ATV tours. 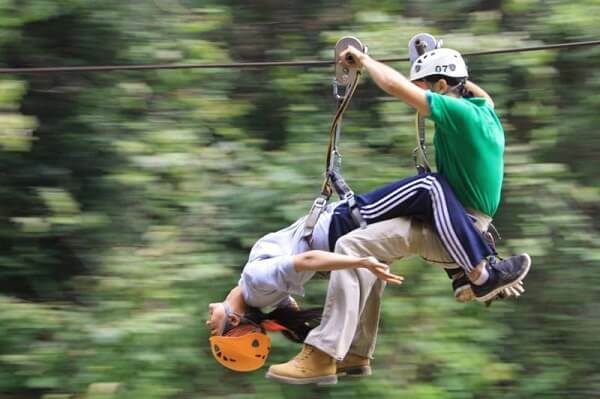 Puerto Vallarta also offers a number of different companies for canopy zip line excursions, which will see you zipping across the tops of trees and sliding into rivers. Compare prices and routes before committing to one company. Puerto Vallarta’s skyline is adorned each night with the lights and fireworks of the Marigalante Pirate ship that offers daily party boat sailings. The Puerto Vallarta pirate ship delivers a great show and delicious food, with drinks included in the price of your ticket. At certain times of the year, you may also enjoy a free child’s ticket for each adult. In addition to the pirate ship there are also other party boats and excursions, including the famed Las Caletas boat ride called Rhythms of the Night for a pre-Hispanic show on a private beach.